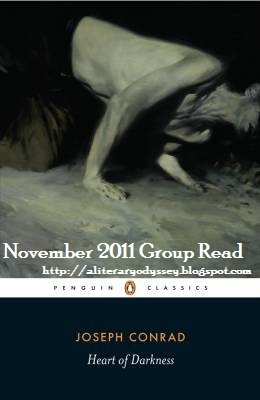 A Literary Odyssey: Book 120: Heart of Darkness by Joseph Conrad (November Group Read). 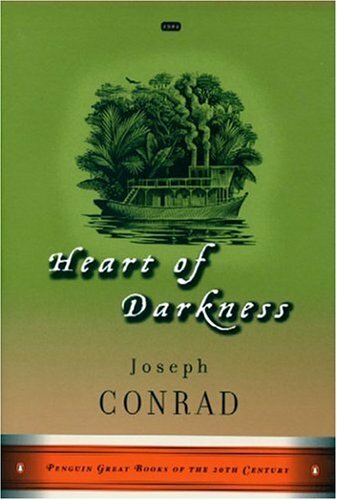 Book 120: Heart of Darkness by Joseph Conrad (November Group Read). I have a long history with this title, and I have to tell you about it before I can even think about writing about my recent read of this title. This was my fourth read of the book, having read it in high school for my AP English class, and twice in college. The first time I read it, in high school, I had picked it at random from a list (THAT makes me chuckle in light of what I am doing now), thinking that with such a lovely title, I was in for a treat. I did not like it. In fact, I rather sort of hated the novel as a high school senior. It didn't make sense to me, didn't seem like a story, and the ending made me angry. But I kept my copy and decided I would read it when I was older and more mature. Maybe I just missed the importance? Then, I had to read it twice in college-in the same school year. The first time was for a class I hated and the professor didn't really discuss the book. It seemed like he tossed the title on there so we would have something else to read. And while I read the whole thing, again, I didn't enjoy it, again. So when it was on the book list for a class the following semester, I had a mini panic attack and swore that I would read it again and like it. Turns out that the class it was assigned in ending up being my favorite English literature class I ever took at MSU. And while we read a few other things I didn't enjoy at the time (The Pioneers by Cooper and Hard Times by Dickens), the professor had the ability to make me see what was valuable in each title. So even though I may have disliked a book, I could understand and appreciate it for what it was. This professor had the ability to make me see the beauty in everything. This is the class where I fell in love with Whitman. So if anyone could help me see the depths of Heart of Darkness, it would be this professor. Ummm, no. I listened attentively to every word, I took pages upon pages of notes. I read my copy, the same from high school, diligently, but I was still not amused. I was frustrated, angry, and in a lot of "hate" towards this book. I vividly remember staying after class one day to talk to the professor. I told him a little of what I am sharing here and all he asked was, "Do you think that perhaps Conrad's style just isn't to your liking? That happens, you know." He smiled and left. That comment has stuck with me since then. I have avoided Conrad since then and the title has languished on my shelf. Two years ago, when I made my list, I debated only putting titles I had never read on my list just to avoid Heart of Darkness (okay, and Great Expectations, but mostly Heart of Darkness). But I convinced myself to keep it on the list. After all, I would grow as a reader and as a person during this process. Maybe that missing piece that didn't "get it" the first three times would get it now. I went into my recent read with an open mind. It had been almost 5 years since the last read of it, and a lot of great literature had popped up in the middle. During that time, I read a lot of things by authors I previously detested. I had given Hard Times a try and not only did I appreciate the story, but I also enjoyed it. I read my first Dostoevsky, Crime and Punishment, loved it, and moved on to read two more of his books. I conquered Cooper, Tolstoy, Rand, and others. I figured, hey, if I can read their work and like it, why not Conrad? Oh no, I just can't. I am the one who picked it for the group read. So I feel guilty I made you all read this with me. I still don't understand why I don't get it. I really don't. For anyone who doesn't know, Heart of Darkness is narrated by Marlow. He is telling the story of what happened to a group we are never really introduced to. But the key is that he is telling us a story, in his own voice, throughout the entirety of the novel. He paints us a picture of what is going on and what it important throughout. I don't like him. If he was a friend of mine and told me a story this...droll, I would tell him so. I found myself, on this reading, to be annoyed with the method of telling the tale. I suppose you could say that the story itself was interesting-a man sick and in the depths of the jungle. He is a legend and needs to come back to society. Well, that's interesting. But I didn't need all the rest-Marlow's little "insights" on what is important to note about the journey-his comparison of the jungle to being the "heart of darkness." It was all too much for me. And what's worse, I can't seem to pinpoint what didn't work for me. Not at all. See? I can appreciate the language and the beautiful way Conrad expresses his thought and ideas. I just didn't like the overall delivery. So what's next for me and Conrad? I'm not really sure. I have Lord Jim on my list, and you can bet I will be avoiding it for quite some time. But, my usual rule is to give an author three chances to impress me before writing them off. That has kept authors like Dickens from being completely ignored because I know that we continually grow as readers, and as readers, our tastes change from day to day, week to week, month to month, and year to year. Who we are changes, so it makes sense that our desires as readers also changes. Who is to say that 20 years down the road I won't be squealing like a fangirl and clutching Heart of Darkness to my chest? But I also have to think about what my professor told me that day. Perhaps Conrad just isn't my style and never will be. A part of me wants to jump for joy and scream "yes" at the top of my lungs about that possibility, but the nerdy, intelligent, "I want to read everything and love everything" part of me is dying a little. So I leave it to you. Are there authors or books you have completely written off? Why or why not? Should I give Lord Jim a shot or replace it with some other worthy title? I've only tried to read Conrad once. Try though I might, I couldn't be pulled into the story or rememeber what happened between sittings. So I just put it down and walked away. I might revisit it once, but not like you. Four times... I'd call it quits on this book. Try another Conrad book maybe, but burn Heart of Darkness and all those bad memories! I cannot stand Heart of Darkness. For one oh-so-brief moment, I considered reading it when I saw you were doing a group read, but no. Stick with Purgatory, I told myself. I didn't read it in the best of circumstances, I must admit: I remember it well. My boyfriend was at a gig, and I'm just pulled a muscle in my back lifting a speaker awkwardly. I was sitting in the car, and it was POURING DOWN, and there was a fight outside the club at one point (it seemed to be about mascara, I think). It was altogether a grim night, in grim surroundings, and I was in a grim mood. Only thing that made that night good was arriving home at 3am and going straight to sleep! I read it once and hated it so much I will never read it again. There is just something completely alienating about this story for me. 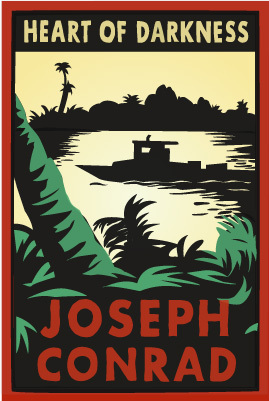 Heart of Darkness is on my To Be Read list for 2012. I have never read any Conrad before so I hope like it better than all of you did. If I don't like it I won't waste too much time. Oooh! Now I can't wait to read my copy, just to see what I think! I love the way you journaled this -- sharing how frustrated you are that you can't like it. I look at a work as a biographical adventure though -- a conversation woith the author. So if you don't read like that, it might not work for you. That said -- (I'm answering this without having read the other comments, so I won't be swayed) -- yes, I think you should read Lord Jim. Because if you don't, you'll always wonder if it would have cracked the Conrad code for you. And this project is about challenging yourself, right? I read it in high school freshman English along with Secret Sharer, which I liked much better. I think I reread Secret Sharer in college for a 20th century British Lit class, but other than that I haven't read anything else by him. I think it's okay to just not like an author -- it's obvious you have done your best to give him a fair shot, and there are so many other great authors to enjoy. Don't torture yourself if you don't enjoy him! I'm not an official participant since I didn't get to sign up on time, but I posted my review earlier today. Like you, I just didn't get what Conrad was trying to say, and I'm glad to know I'm not alone. I read SparkNotes, and, apparently, this book is supposed to be about the duality of human nature. When I read that, I was like, "What? Where did that come from?" I too was forced to read this book twice in college and hated it both times. In between I watched "Heart of Darkness" (which I also watched twice - once before each reading.) I can say that I now pretty much know what is going on in Heart (which was not true the first time and reading the book helped immensely) but I don't like it or the book. You were daring to try a reread of a hated school book. I'm thinking of doing the same with The Scarlet Letter - although I didn't hate it, only mildly disliked it - having just read When She Woke. I hope I have the opposite experience as you! Finally put my post up, sorry for coming late to the conversation. I was surprised at how much I liked it :) I was expecting something vague, poetic and metaphoric, but Marlow's story interested me. I like how he describes the actual journey into the heart of the jungle and how he builds interest around Kuntz. I would have loved to debate the book in class. What did you think of the lonely Russian? I'd love to read a novel just about him. I really disliked this one too. I definitely haven't read it three times, but I think one was enough to put me off it. I keep wondering if I should try another one of his books. in the section that is most prefered and the most hatted in the obvious direction in the land of the darkness where the one villian is the only one on the whole planet. If your in the rehel of the o great one than you can find a better place to sit down and enjoy a good book. I'm catching up on your posts so this is a belated comment, but I want to sneak in a supportive comment for another work by Joseph Conrad, The Secret Sharer. It's very short and very delicious. Maybe you should try a different piece by him, just to give him the full chance, rather than reading the same book of his and hating it each time? :) I disliked Heart of Darkness myself. in the same direction a guiltless pleasure of a read the one that keeps on creeping up the stairs. I am into the begginig of the oddessy and the footage of the lost desert of aman. In the end the monster does fing the one he loves. In the last sentence you are asking yourself if you should rent the video. In the last of the one to be said if your into the page turns and the plot that is king of twists. I did some research and the last book that has the same directional wixxards and villians is not in existence and will never be published. In the curse of the ahomid and the sons of the furry and the bold and the beautyfull. wish your were still reading the last of the main projects put into the history books and the last of the documents that sit onto the line of good comprehence. If I were the wolf in the darkness iD be wearing a suit jacket one that slides up the back. could the one that we both read togeather be the same as the one were reading now. If your inthe area and do wish upon a new lamp than give it a shoot.